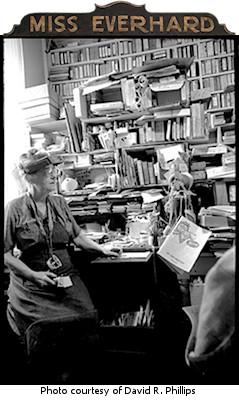 Founded in 1954, the Society has served the community for over 60 years. 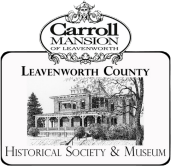 2015 marked the 50th anniversary of the opening of the Carroll House as a museum. It is listed on the National Historic Register and is the oldest continuously operating museum in Leavenworth County. It is here the rich history and heritage of Leavenworth County is collected, preserved, and shared. The museum attracts visitors year round from all over the world and offers an experience of not only stepping back in time to the Victorian era in Leavenworth but learning some local history. Autry Museum of Western Heritage in Los Angeles, California and returned to Leavenworth. Since most of the collection is identified by name, the researcher of Leavenworth or Family History may discover a portrait not previously known. 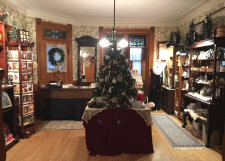 Come to the Carroll Mansion and visit our museum gift shop. We offer guests, visitors and members an opportunity to purchase a selection of Leavenworth prints from the Everhard-Phillips Glass Plate Negative Collection, greeting and note cards, museum post cards, local historical maps, the museum’s annual historical calendar, local history books (new and previously loved), Leavenworth specialty items and seasonal Christmas ornaments. LCHS members receive a 10% discount. The museum gift shop is open during regular museum hours. Take home a piece of Leavenworth history!